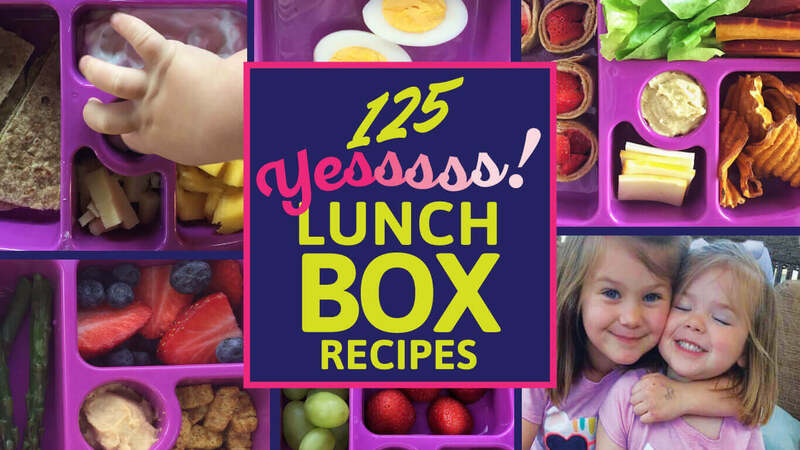 UPDATED: I’ve taken my most popular post (125 lunchbox ideas) reviewed the recipes, and updated everything for the 2018–2019 school year. Enjoy. And don’t forget to download your copy of the handy printable collection—and get another 25 recipes for free! 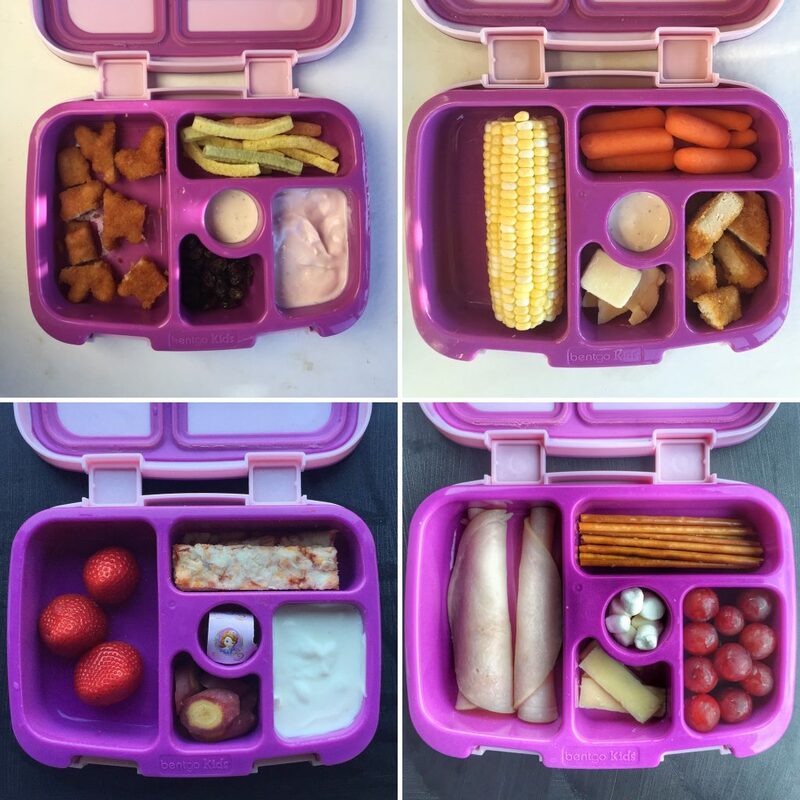 When it comes to healthy lunchboxes for my kids, there are two sides to me: food-loving dietitian mommy, and woman who gets really bored—really quickly—with packing kids’ lunch boxes. One one hand, making a balanced and tasty healthy lunch for my girls each day is my highest priority. But listen—I’m always on the lookout for lunch box ideas to make that process easier. 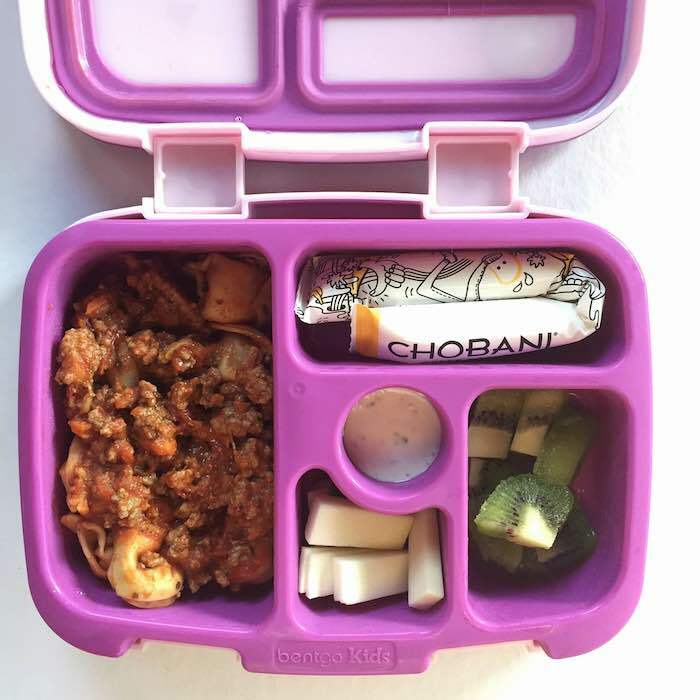 If you’re like me, you’re probably already burned out on trying to come up with new, creative, healthy lunchbox ideas for your littles ones. But coming up with a healthy lunch day in and day out doesn’t have to be difficult. Stick with me, mom and dad… I’ve got you covered—here are dozens of easy, healthy lunch ideas to love! 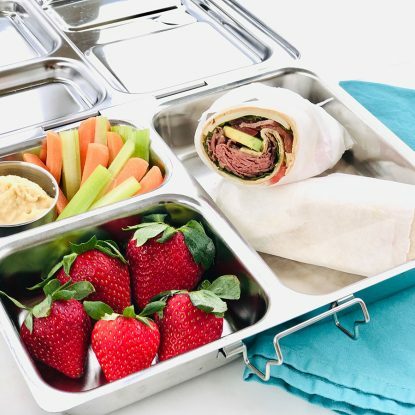 Now you can take the guesswork out of making healthy lunchboxes for kids—and the brainwork out of coming up with the ideas. Don’t forget to scroll to the bottom of this post for tips on how to use the list! 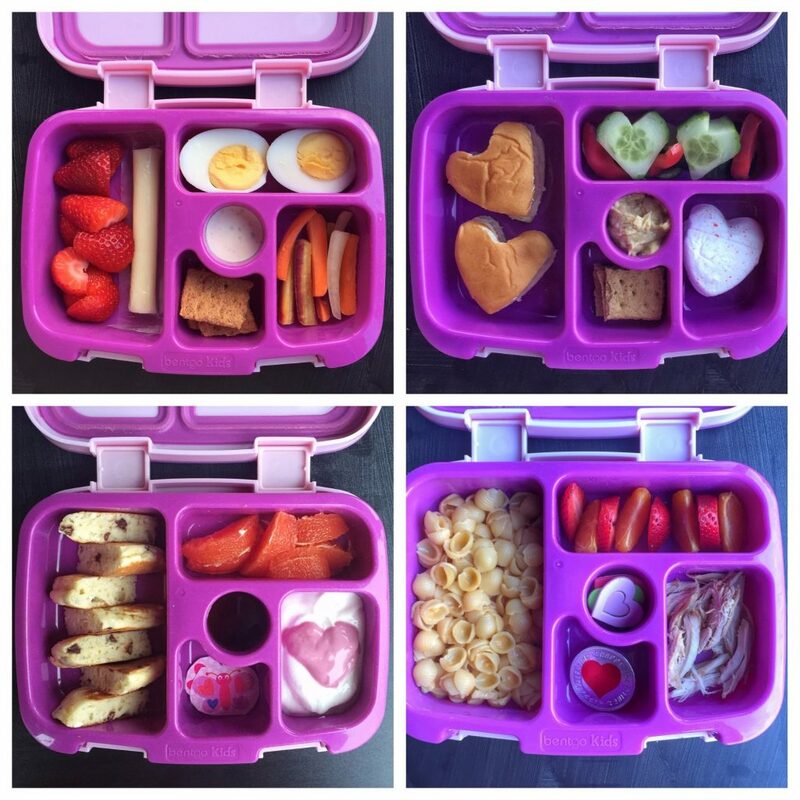 Why use these kids’ lunchbox ideas? This list is the one I always wished I had—and I strongly encourage you to use it yourself. Using these dietitian-prepared combinations will also empower you to try new foods with your children, and encourage your kids to enjoy foods that taste good. what I call a “happy”—things like chocolate coins, love notes from Mom or stickers that bring a smile. Stick to this formula, and you can’t help but make a healthy lunch. One thing I want to say, though: I’m not perfect, and I’m not afraid to send items that may have some sugar, salt, or fat. I’ll give my kids cake, chocolate chips or potato chips now and then, and ranch dressing has a starring role in many a lunchbox. When this is the case, I find ways to balance their intake of lower sugar, salt, or fat in the lunchbox and throughout the day. For example, some brands of yogurt are pretty high in added sugar—but I’ve had a hard time getting my girls to eat plain yogurt sweetened only with fruit. So I do things like make “half and half” yogurt by mixing the sugar sweetened yogurt with plain yogurt (and they are none the wiser)—or I may just go all out sweetened here and there. Because to me, some sweetened yogurt is better than no yogurt at all. Similarly, it’s worth 1 tbsp of ranch dressing to get them to eat five carrot sticks. The other thing you need to realize is that not every healthy lunchbox has the complete formula every time. On those days they miss veggies at lunch, for example, or have no dairy in the box, I make sure to make up for it another meal. We may have double veggies at dinner, say, or cucumbers and hummus for an afterschool snack. And as you go through the list, you’ll see that many foods repeat. My kids love low-sodium deli turkey; hummus or ranch for dipping vegetables; pasta (spaghetti, tortellini, mac and cheese); hard-boiled eggs; carrots; and all kinds of fruit. That’s why I’m not afraid or ashamed to offer those foods over and over again—plus I know they’ll get eaten and I’ll end up wasting less. However, I also try to include unfamiliar foods here and there, since they are often more apt to try new things in their familiar and comfortable school environment. 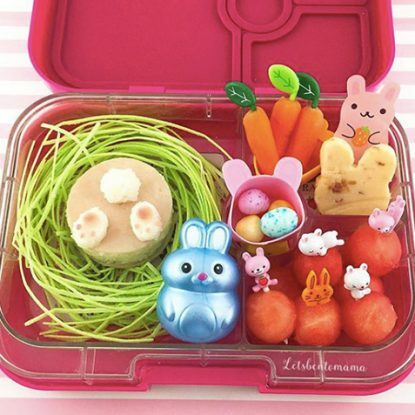 As you can see, none of these healthy lunchbox ideas are earth-shattering or unrealistic. 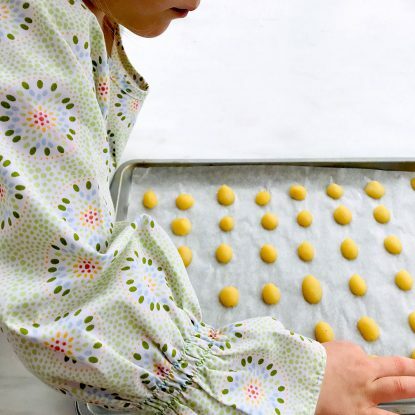 In fact, I use the phrase DOWN-TO-EARTH, DOABLE, AND DELICIOUS over and over when I describe how we approach food in my family, because I believe in making sensible food choices that focus on flavor and variety. 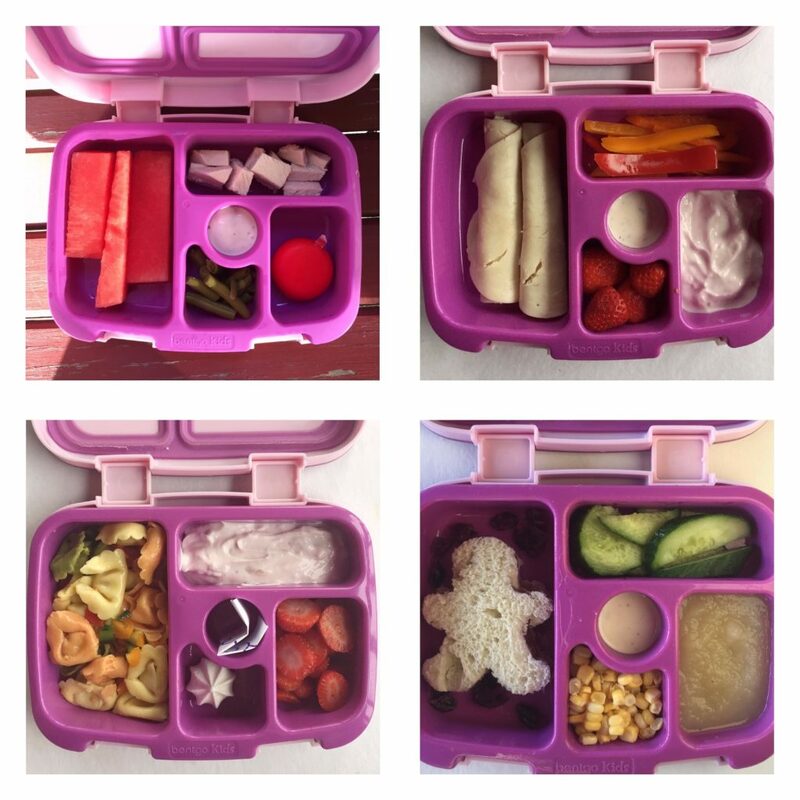 That’s the thinking behind these healthy lunchboxes—the kind of thinking I hope to encourage you to explore. Go ahead and download my handy printable and get started. Good luck with your school lunches! Good work! Your daughter is one lucky little one! Holley, this is such an impressive post – your dedication to feeding your children healthy, nourishing food on a daily basis – and helping others do the same – is amazing and applauded! Where did you find this lunchbox? I love it! You can find amazon links from my website at holleygrainger.com/shop. These are Bentgo lunch boxes. So many creative, simple, and yummy lunch ideas here! 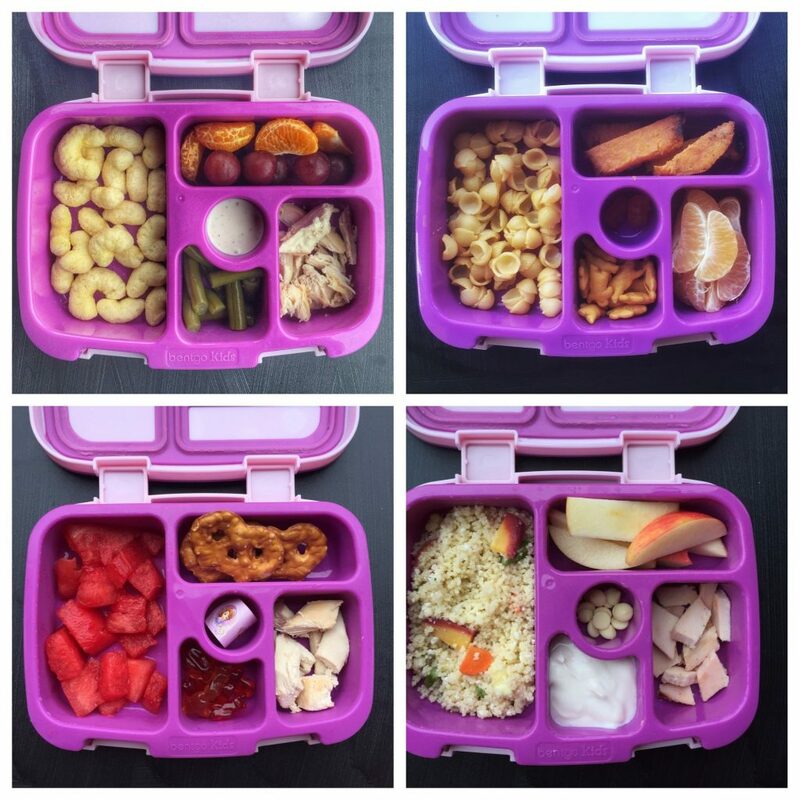 This guide helps make healthy eating and lunch packing less daunting and more doable! Wow – impressive! So many wonderful ideas! Impressive list! These lunches are so fun and nutritious. Thanks for sharing! How do you keep your apples from browning. My daughter doesn’t like them “dirty”. Tried explaining, but didn’t work. Too funny! I sprinkle with Fruit Fresh or toss with lemon juice. You can also sprinkle with cinnamon to flavor the apples and masque the brown. Did you mention what kind of lunch box you use? I’m tired of all the little containers??? These are Bentgo Kids lunchbox containers. I went through the same thing for a year and got SO tired of the small ones or the numerous plastic bags where everything got crushed. I also like Planetbox. If you go to holleygrainger.com/shop, there is a direct link to the boxes. My kids like fresh apples. Drop them in a lemon lime soda like sprite or 7 up for 5 minutes. In baggies they stay clean for 4 days. They have a slight sweet taste, not bitter like lemon. And it’s just to preserve, it’s not like they are drinking the soda. Yes, I agree! I tested 12 different ways to keep apples from turning and the best result was fruit fresh. Sprite did pretty well as well and I agree that the slightly sweet taste is more pleasing than lemon. Thank you thank you thank you! Are these all served cold or does your child have access to a microwave for some items? How does that work? Do you prepare in the morning or night before? Hi! I try to prepare at night but many days it turns into a rush in the morning. Yes, both the girls have access to a microwave although they both like many foods cold-room temp so the temperature varies. Nowadays it is more advisable for our kids to bring thier own lunch boxes at the school. This way you know they are eating healthy food. 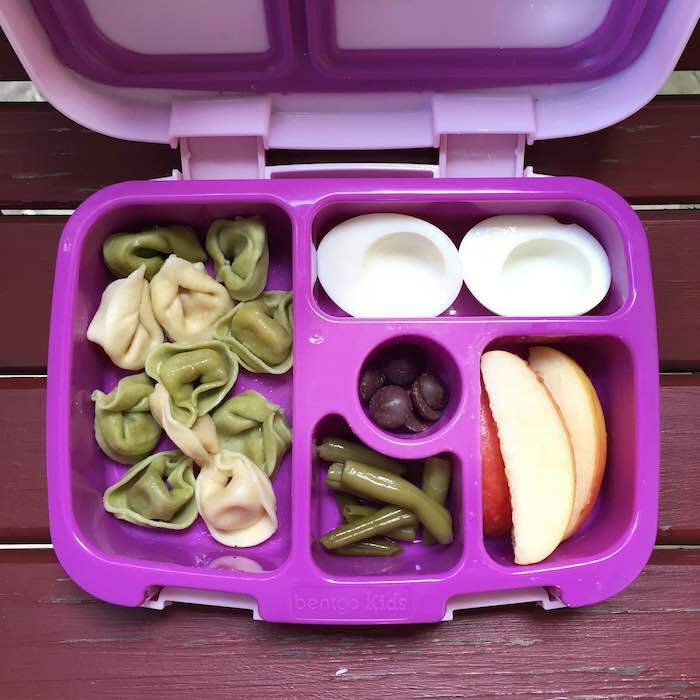 When you pack items like pasta with sauce along with things like grapes and yogurt in the same container, do your kids eat the pasta/sauce cold? Or do they just end up having to eat their ‘snacks’ before the main course so they can heat it? Also, are those containers microwave/dishwasher safe? Thanks for the inspiration! Great questions! Kind of a combination. The girls like many traditional warm foods cold or room temperature so they will eat everything at once as if they were eating on a plate of food. Their school will heat up food so the teachers told me they would just spoon the pasta onto a small plate, warm and put it back in the lunchbox. I felt like this was likely a pain for them to do so I started either sending a plate or packing the entree food that would require reheating and would be a bear to spoon out in a separate container. And yes, the containers are both microwave and dishwasher safe. The trays can be removed from the outer lunchbox shell (not recommended for the dishwasher but we will stick them in there sometimes and they are still holding their seal great. Do you cook the canned green beans before putting into the lunch boxes or just take them directly out if the can? Natalie–moment of truth!! I usually take them out of the can, rinse them and put them right into the lunchbox. You could certainly heat them if you want. I love your ideas! Just wonder how do you keep your lunchbox cool or if there is a need to. I would love to pack fruits & yogurt & dipping sauces for my daughter but I am worried that the food will go bad. I literally pack her morning snack box around 5.30am – 6am, leaving the house at 7.15am, her morning snack time is around 9.30am. Is it still safe for the yogurt to be in room temperature for more than 2 hours? we have a hot climate here mostly around 30 degrees in Malaysia. Also, I am getting prepared if one day I am going to pack her lunch, the time difference would be even larger. Thanks for your inpiration! Thanks for your kind words. I always include an ice pack if the food is perishable. You could also freeze a water bottle and use that and then the water should be defrosted by lunchtime. I prefer for foods like yogurt, cheese, dairy-based dips, etc. to be kept cold. Would you be willing to do a series of lunches that are egg and dairy free too? I know I can mix and match out of these for my son who is allergic to egg, dairy, and red meats but it would be cool to see a go-to group when I’m in a hurry and unable to plan. Yes! That’s a great idea! I am working on customizing some posts and I will make sure to do that. Be on the lookout!! I love this post. You make the lunches look so beautiful! My child’s school will not heat up her lunches for her but she may be willing to eat some of the pastas cold. I was wondering if the yogurts and sauces stay put inside their compartments? My daughter will definately not eat ketchup covered apple’s for instance. Does the pretty heart you spooned on top of the yogurt stay in place? Thank you for helping me think outside the usual lunch box! Thank you, Krystal. Everything stays in place but because the girls turn the boxes upside down in every which way, the yogurt will also get on the top of the box so when they open it, there may be yogurt on the top. I need to add some pictures to show everyone. I put a small piece of press and seal over the yogurt to keep it in the little container. So easy and always works. Regarding the heart, not sure if stayed. Very unlikely but they helped me prepare the lunch so they knew it was there and had fun making it in real time. Thanks for asking for clarification. I’ll go back to the blog since others likely have the same question. I use half vanilla-flavored yogurt (this is usually sweetened with sugar as well) and half plain Greek yogurt (no sugar and no flavor) to cut the sugar in half (vs using all vanilla yogurt). You could also add vanilla and honey to plain yogurt to sweeten it. 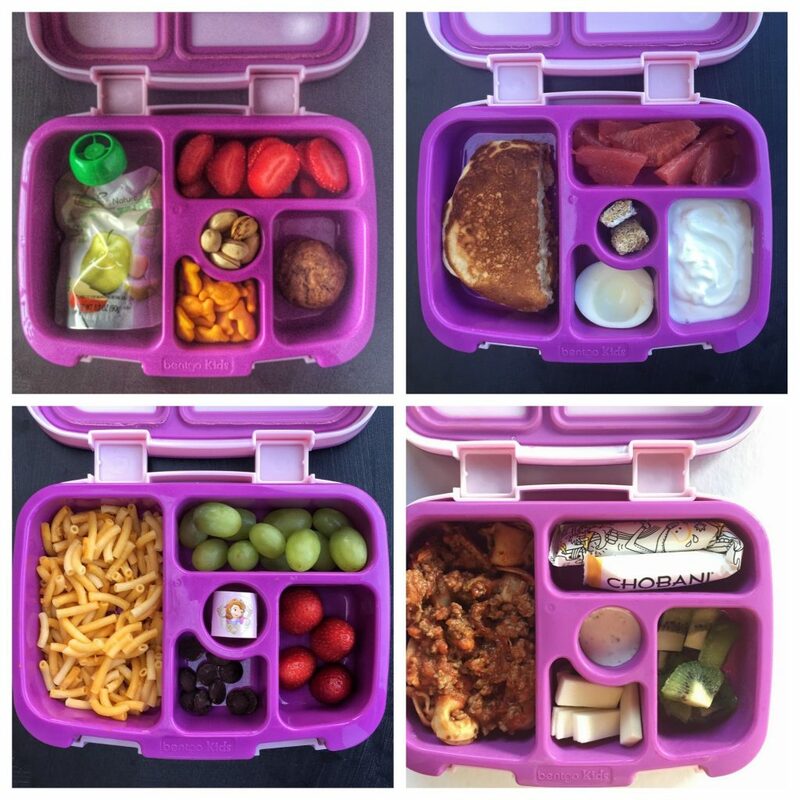 I love this idea, kids get bored with the same lunch all time! It would be great if there were a printable link (text only) of the ideas, in the meantime I may have to copy/paste into a word doc! 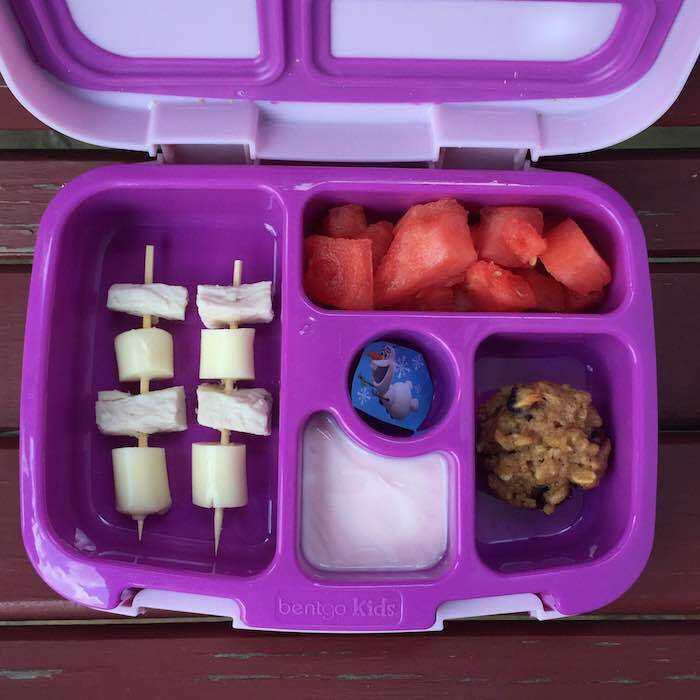 🙂 Thank you for these great ideas, I’m sending my son to camp daily with lunch and I can tell he’s bored with my choices! Hi! Do you put the bento box into a lunch box with an ice pack? If all the food is precooked would you think it can be eaten at room temperature and not reheated? Thank you so much for all the wonderful ideas and pictures. This is such a huge help. I’m actually excited to make lunch for my kiddos now. I use an ice pack in an insulated lunchbox since the Bentgo lunchbox that I use does not keep hot food hot and cold food cold. The food can certainly be eaten at room temp but it really is a matter of food safety for me. You don’t want it at room temp for too long. We are fortunate that Frances’s school will reheat food for her if needed. Hi! I am LOVING this! And I’m looking into purchasing the Bentgo box! I have a couple questions, though! How old is your oldest? Specifically which grade was she just in? 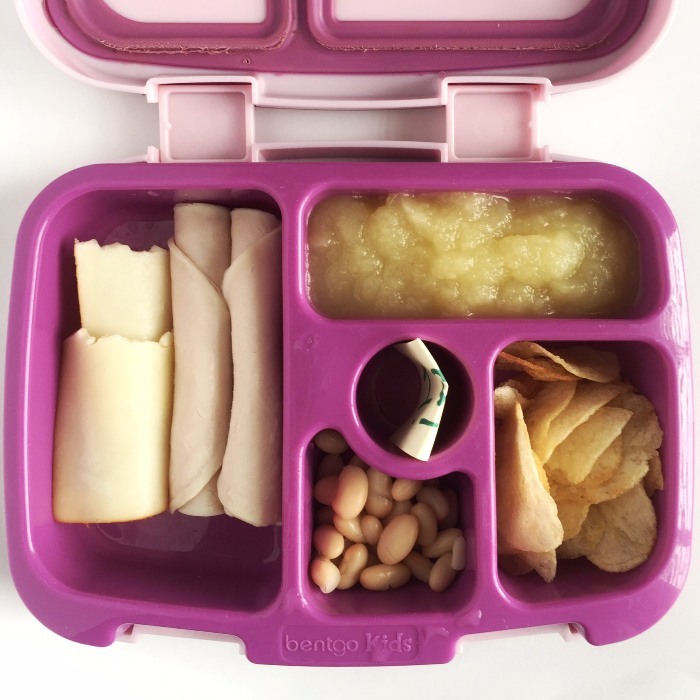 Do you put the Bentgo in another lunch box? If so, which one? My boy is going into first grade and will be responsible for his own lunch box at lunch time, so I’m trying to figure out where a water bottle and utensils are going to come into play! Thank you for your help! Hi Jennifer! Thanks so much. My daughter used this last year in 4k and starts her red shirt year (4k again) on Tuesday. I use an insulated lunchbox from Oh Mint (http://www.ohmint.com/By-Item/Gumdrop-Lunch-Boxes/) and it sits right in along with a thin ice pack (I use both the Bentgo brand ones as well as some from Rubbermaid). I just put a napkin and utensil in the bag and it still has room for a water bottle. She is able to open it all by herself. I have the bento box but haven’t used it yet because I can’t figure out how to keep it cold. You mentioned using an ice pack but it doesn’t appear one will fit inside the bento box. Do you put it on the outside and then in another lunch bag or something? What kind of ice pack do you use? I put the ice pack outside it and then put it in another bag. Holley, these are SO great! I just got my 2 Bentgo lunchboxes and I’m so excited to practice and get started with your amazing ideas! Thanks for putting these all together! This is super awesome. Bookmarked it! Holley thank you so much for sharing this with us! I often can’t think better than sandwich, nuggets or corn dogs lol. I have boys and was curious how old your girls are? And if this was enough food? Or did they need more? 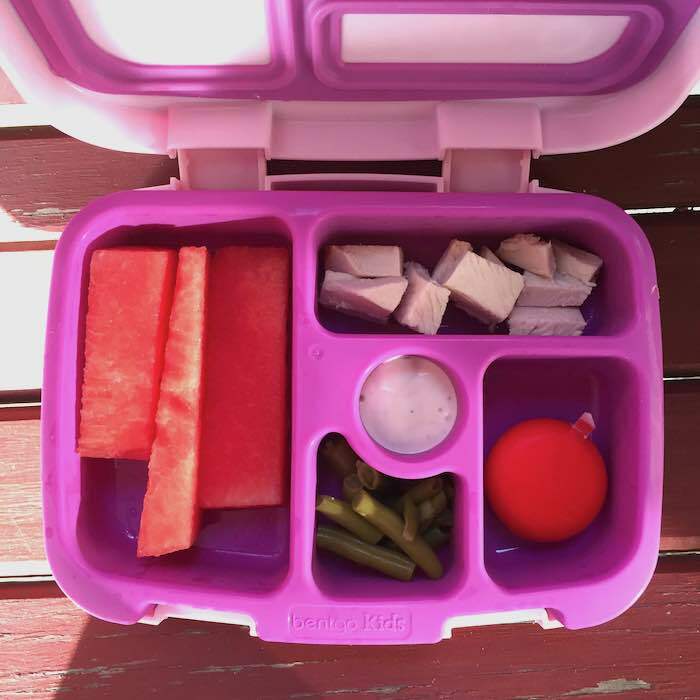 My girls were 2 and 4 this year when they ate these lunchboxes. The boxes hold quite a bit of food and really it depends on how nutrient dense the food is (1 cup of chips vs 1 cup of spaghetti). 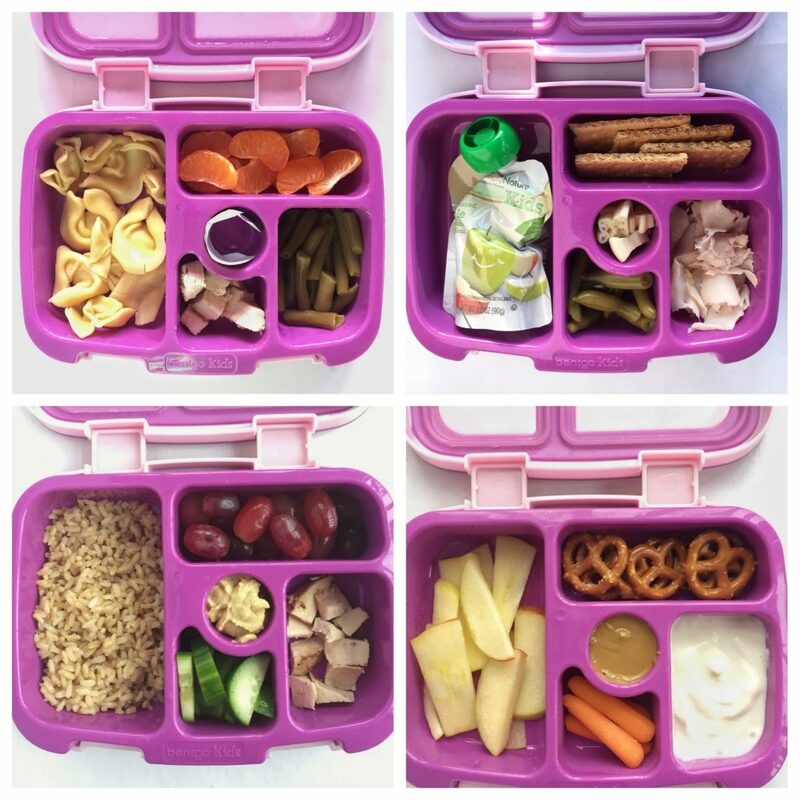 I did a Facebook Live on Holley Grainger Nutrition and shared different types of lunchboxes in case you want one that holds more. I hear you! Nothing like crowdsourcing with other parents in the same boat. I hope this helps! Do you think these boxes will work for an 8 year old boy? Is he a big eater? I’ve seen other parents share images of their child’s lunchboxes and the ages range. They really can hold more food than you think and I use it for myself some times. 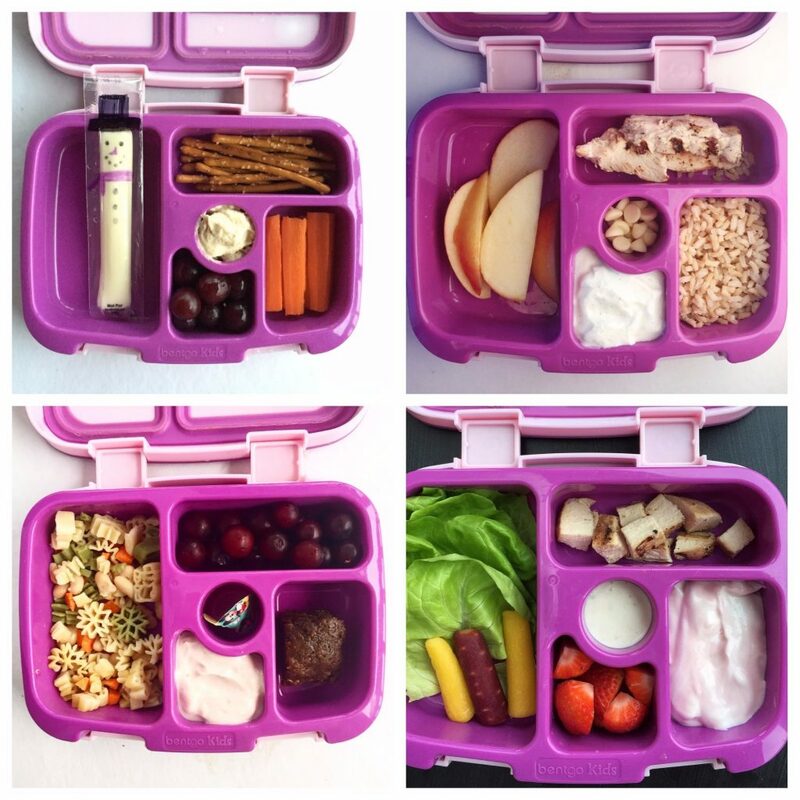 If you want a larger option, Bentology’s lunchboxes seem to hold more as well as Planetbox. Love, love, love the bentgo lunch box. We used it daily last year for kindergarten. It held up very well! I just ordered one for this year even though the other on is in good condition. I do wish that the freezer cool pack actually fit inside the lunch box under the tray insert somehow. I have a bit of a picky eater but hopefully with some of these new ideas I will get out of our lunch “usual” rut! I’m so glad that you like it! I agree–wish the same thing! Love, love, love this post! Thank you so much for the great ideas. I am now a school lunch making queen 🙂 I have to ask why the white out lunches. Also our your girls able to use a microwave? My daughter doesn’t have access to one at school so I’m wondering if these options are still possible without being able to hear anything up. Thanks again! You are a rockstar! You are so sweet. So the white out lunches started last year around Halloween when I realized that every food I had in the house for a lunchbox was white. It just gave me a theme to run with. No special meaning! One of my girls has microwave access and the other doesn’t. Many of these options are certainly applicable and another possibility if to heat the food in the morning and store in a thermos. Thankfully, my children prefer cold to cool foods over hot so it has worked out well for me! Let me know if I can help you with more! How do you get your kids to eat cold corn, mac n cheese, chicken nuggets and rice? Sounds gross. Ha! I know, right? Thankfully, my youngest can have her food microwaved (and my oldest did last year). They don’t have an issue with it but it is possible that they’ve eaten it that way for so long that they don’t know otherwise. I’m so glad! I hope you enjoy! I was wondering if some of the menus you use require heating, like the chicken or mac n cheese? Or are some compartments heated prior to packing? The Bentgo lunchbox that I use in most of these photos is airtight but is not heated. Most foods are prepped the night before so they are kept in the refrigerator over night. The girls did have the option of heating at school last year but not this year. There is a box that has just hit the markets called the Omiebox that does have a compartment for hot food that you heat prior to packing. Your ideas have inspired me! My daughter wanted to try to buy her lunch today and she decided that she likes these lunches much better! Although expensive, for convenience I bought 5 bentgo kids boxes and pack on Sunday for the entire week. Although more expensive than the school lunch, I feel so much better knowing that she is eating something healthy. I’m so glad to hear that you’re having good luck packing! One of my daughters also wants to buy lunch so she is going to try it after Labor Day. I’ll be curious to see what she thinks! These are great ideas, Holley! What ages are these portions supposed to be for? Amazon says the portions for this size bento box (the link you posted) are for ages 3-7 but that seems really broad to me. I have 2 and 4 year old boys. I have a 3 and 6 year old but have used these for this Bentgo for the last few years with the girls. I know that does seem broad but I think for the age range of your boys you’ll be fine. I love this and have used some of your ideas. My boys laugh and other children are having fun watching what will be in the lunch today ! I would like the correct description to be with the correct picture – sometimes I am unsure what is pictured until I find the contents listed later in the list. Great ideas! Thanks for letting me know that the blog is out of sorts. I’ll go back to check to make sure the images are appearing where they need to be. Thanks! Thanks for letting me know. We’ll check on this and get back to you asap. Wow. Thank you so much for taking the time to create all these wonderful lunch ideas. I have been struggling to find way to get my daughter (6) to eat a healthy lunch but 9 times out of 10 it comes back with only nibbles missing. This has given me a lot to think about. I am excited to try these out (with a few vegetarian tweaks) as she starts Grade 2! Thanks for reaching out, Amanda. Let me know if I can help out! Do you bring your daughter in to help you make lunches? That was a game changer for me. I found that the more the girls help the more likely they are to eat their lunch. It doesn’t always happen (especially on busy mornings) but I always try to give them a say in choosing at least a few items that will go in their lunchbox. Another thing to pay attention to is what her environment is at lunch. I’ve observed that often children don’t have enough time to eat. they’re too busy talking/socializing to eat, etc. Also, if snack time or even breakfast is too close to lunch (Ellie had lunch at 10:30 last year) then that often interferes with how much they’ll eat. Good luck!! Thank you for this post! 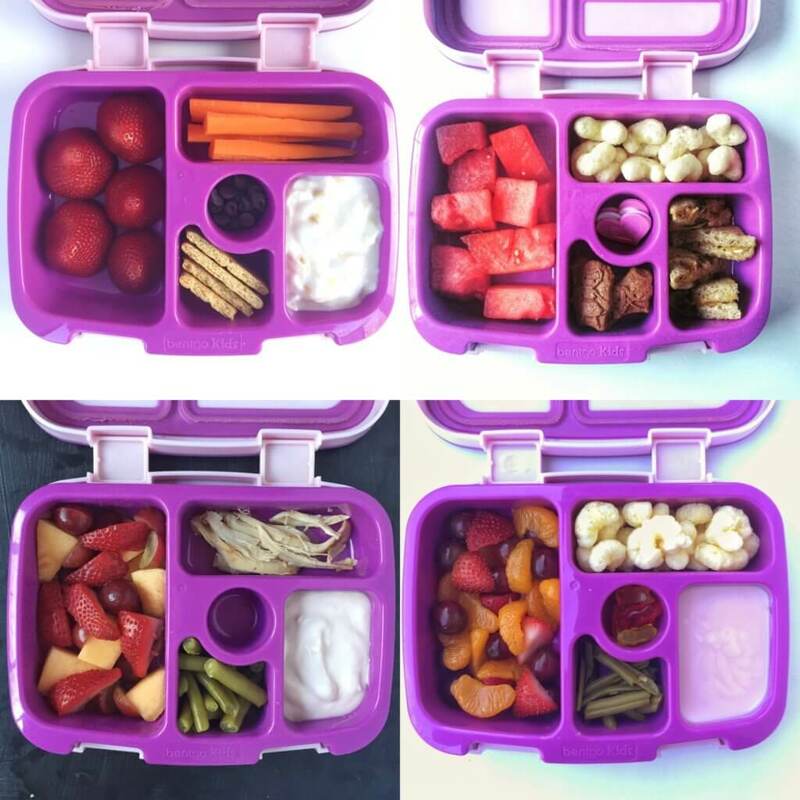 My son is starting to take his lunches to school to start eating healthier, and this helped give us a bunch of ideas! I am so excited! Let me know if you ever have any questions!